Dirt and dust kick up under the pounding hooves of a bucking mustang as a cowboy clutches to its back, cheers coming from the surrounding audience. This is the scene for ten days every June, when cowboys, bulls and broncos entertain at the Reno-Sparks Livestock Events Center for the Reno Rodeo, an annual tradition since 1919. Despite the rodeo’s long history, it is not without controversy. Over the past two years, the Reno Rodeo has been under scrutiny by the Illinois-based animal advocacy nonprofit Showing Animals Respect and Kindness (SHARK). Videos produced by SHARK in 2011 and 2012 show horses being shocked in violation of Professional Rodeo Cowboys Association (PRCA) rules. One disturbing clip from the 2012 video apparently shows a young cow’s neck being broken during a calf-roping competition. The findings appalled Steve Hindi, the founder of SHARK, who says the organization produces the videos to allow people to decide for themselves whether they agree with what the rodeo offers. The PRCA sanctions some 600 events per year and has about 60 rules governing everything from allowed equipment to grounds conditions to the treatment of rodeo animals. In 2012, the PRCA also implemented a rule against “jerk-downs,” where a calf is pulled over backwards during calf-roping competitions. The PRCA’s rules allow for the use of 5,000 to 6,000-volt electric prods in certain situations. “We allow the use of the prod on the neck or the shoulder if the animal stalls,” says PRCA spokeswoman Cindy Schonholtz. “You just want to make sure they get out of the chute.” She notes that a stalled animal presents a danger to itself and the rider because horses can rear over backwards if they don’t exit the chute quickly, and compares the shock created by a prod to less than a livestock fence or electric dog collar. A higher-powered, 10,000-volt device was used during the Reno Rodeo, Hindi says. Reno Rodeo spokesman Steve Schroeder has said the rodeo does not agree with the shocking shown in the videos and does not want animals shocked. He told the Reno Gazette-Journal the video of the calf represents an unfortunate incident that sometimes happens at rodeos. Schroeder did not return multiple requests for comment for this story. Schonholtz, who attended the 2012 Reno Rodeo, says the PRCA sent a letter following last year’s event reminding organizers of PRCA’s rules in regards to prod use. “They should know we’re keeping an eye out for the enforcement of that,” Schonholtz says. While the PRCA has suspended and expelled members in the past, Schonholtz declined to release any details about fines or suspensions issued by the organization during the past two years. “Regarding the Reno Rodeo, the rules regarding the use of the prod and the no jerk-down in the tie-down roping were enforced and violations were dealt with as outlined in the PRCA Rulebook,” Schonholtz says. Hindi called the PCRA’s rules “pretty much a joke” designed more for public relations than animal welfare, and says his organization will continue to pressure rodeos regarding their animal welfare practices. There is “a pretty good chance” SHARK investigators would be at the 2013 Reno Rodeo, he says. 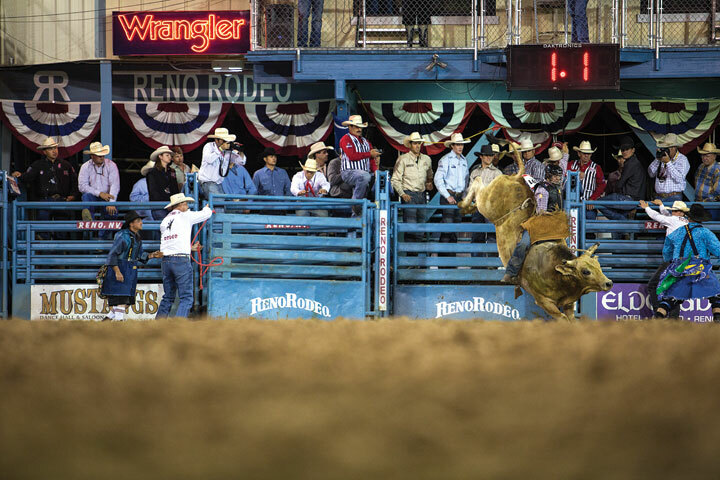 Despite the controversy, the Reno Rodeo is more popular than ever. The event reportedly attracted 150,000 people to its grounds over ten days in 2012, the most in its 94-year history. “It was a great event and continues to be a great event,” Schonholtz says.